Thank you all for the nice replies in response to my post. Lou - I love the 737 - it is still getting the most time in my log book, even though I've had it for several months now. I do hope that someone is willing to take on the challenge of the Connie, or a similar long-range prop-liner. (Dare I hope for the pressurized, two deck Boeing Stratliner - I get weak in the knees at the prospect - isn't there a good b-29 model to start with? )Were I not in the middle of a new job, I might take it on myself (perhaps for FS 2004. I know nothing about programming, designing etc, but there are lots of really talented people out there and I know a little about project management. This is an era not well represented in the FS world, with the exception of the Classic Airliners page. We have the terrific MATS DC3 package - but nothing of that quality for the Douglas DC-4 series, the Constellation models, or the short-lived four engine turbo props (the Electra and the Viscount being the two that come to mind). I think there are a lot of folks who grew up in that era and took their first flights on these airplanes. I know my father flew home from graduate school in United DC-6s back in the early 50's. So, some folks might very well be willing to pony up to re-live a moment or two from their youth. LouGreat job on the Archer! This is the first plane I ever landed for real. Love to fly it. As far as the demand for a great Connie I think you are underestimating the market. Look at how many copies of Jan Visser's R4D-DC3 are out there. I believe if you built one up to those standards you would sell a ton of them. I know I would be first in line even if the price was around $25. That is what the donationware CD of the DC-3 costs and thousands of people are flying it. It has even spawned it's own Virtual airline. For now Vintage airliners are very under represented, the DC-3/R4D is pretty much all by itself. A Connie would be the pride of my hanger as well as i'm sure hundreds if not thousands of others if you were to build it. Anyone else out there agree? 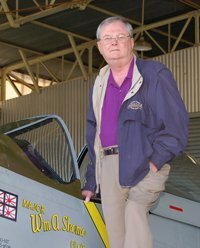 Speak up!Ken Peckham"We have a perfect record in Aviation"We haven't left one up there yet!"